A lot more has happened since the last update! Plus, like Swarm, this ride has a theme song for it! I've had a listen and it's pretty decent. This coaster actually looks pretty ugly in flesh, also I am not really a fan of it's layout. I totally agree with CP2013, that the layout is far to simple for my liking, and if I was given the choice of riding this or GateKeeper in their opening season, GateKeeper would win with no contest for me. What! Yes, it is a simple layout but I think this looks amazing! It may not be as beautiful as Gatekeeper but it is still pretty cool for what it is. Looking good! Quite an interesting idea for a ride this, not sure it will work with any more than 1 train possibly 2. Does look fun though. 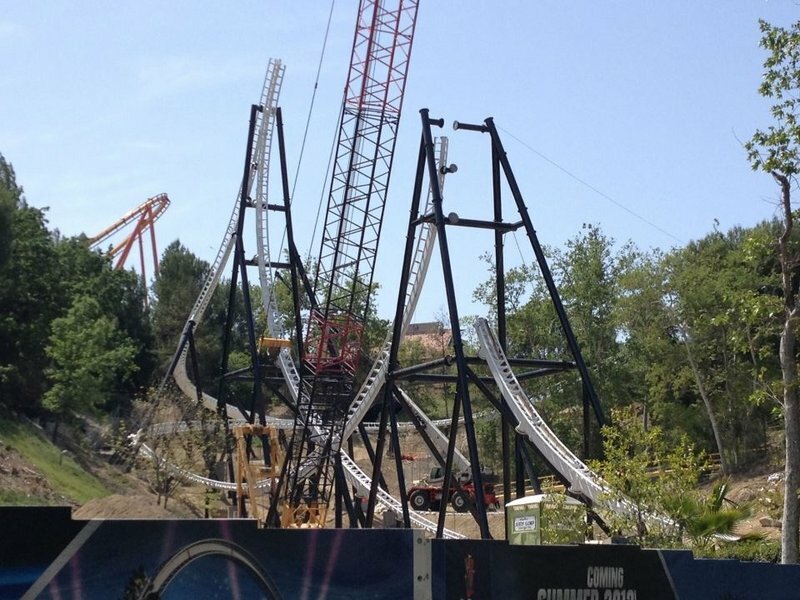 Full Throttle's inversion/top hat is now complete, I agree with Thekingin64 and think this does look really good. That does look amazing! If they manage to time it, so there's train in the loop while there's on on top so it looks like they're mirroring each other, this will be a great ride to watch. Thekingin64 wrote: That does look amazing! If they manage to time it, so there's train in the loop while there's on on top so it looks like they're mirroring each other, this will be a great ride to watch. That would be cool, but I highly doubt that would happen, purely because of the case of a train rolling back/stalling on the top hat, however the only way I can see it sort of working is if they have a sensor at the top of the top hat and when a train fully clears that sensor it launches the next train, which may mean a train is going down the top hat when another train is going through the inversion. That would also look cool. I can't see any problem with my idea providing the train goes through the inversion quite quickly.